The ROOT!T Natural Rooting Sponges give a fast and high germination rate, so you can trust and rely on this brand. They are perfect to use if you wish to grow your plants on with alternative growing methods to the traditional methods. Using the Rooting Gel and First Feed will ensure that seedlings and cuttings are in the optimum condition to be successfully transferred onto the next growing phase. ROOT!T Natural Propagation sponges are ideal for use in all hydroponic systems due to their robust structure and clean nature. The ROOT!T propagation range allows you to germinate your seeds or cuttings quickly. If you are growing hydroponically it will give you the certainty that plantlets will be ready to transplant into your system within a certain time frame. Commercial growers that rotate their crops will be able to have their next batch of seedlings ready to plant out to fit into a tight schedule and continue to meet customer demand. Due to the strong structure of the polymer based Rooting Sponge, it is ideal for use in advanced growing techniques demonstrated with hydroponics. The Rooting sponge will not break down or degrade quickly into the nutrient solution and cause blockages within the irrigation pipes or reduce support provided to the plant and root zone. Propagate seeds and cuttings in the usual way. When white, healthy roots emerge from the base of the plug it is time to transplant them into larger pots. Dig a hole slightly larger than the ROOT!T sponge, push coir gently back around the sponge and water in. The roots of the plant will establish into the coir and continue to grow strong. Propagate seeds and cuttings in the usual way. When white, healthy roots emerge from the base of the plug place the ROOT!T Rooting sponge into a net pot and place this into the allocated place (usually a drilled hole in the gully or pipe). Allow a slight gap between the base of the net pot and the base of the trough. This will allow the roots to grow down into the nutrient stream and avoid any problems with disease or lack of Oxygen. Propagate seeds and cuttings in the usual way. When white, healthy roots emerge from the base of the sponge, transfer into the drip feed system. These systems can contain media such as coir, clay pebbles, stone wool, perlite and vermiculite mixes. 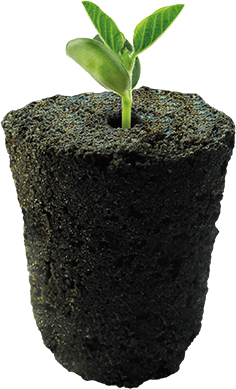 Plant your seedling into the chosen media (or place your plug into a large stone wool block) and ensure that the drippers are close enough to the seedling that the Rooting plug will not dry out.